What does it tell? There were six WVR engagements, gun-only; one resulted in a destruction of Rafale while other four were draws. What this means is that one engagement remains unaccounted for, and it must be Rafale’s victory since both F-22 victory and draws have been accounted for. So score is: 1 F-22 victory, 1 Rafale victory, 4 draws. It should also be noted that while F-22 is almost exclusively air superiority fighter, Rafale is a multirole fighter and AdlA pilots train far more than F-22 pilots in air-to-ground role. Majority of 1/7 pilots (a squadron that did BFM with F-22s) came from Jaguars and Mirage 2000 D/N, and were air-to-ground specialists previously (engagements with F-22s may have been scheduled precisely for that reason). This is a capture of an OSF camera showing proximity warning. As it is video camera and not an IRST, it means that Rafale must have had its nose pointed in general direction of the F-22, diving on it while F-22 is climbing using its afterburner. It obviously did not result in a kill, though it may have resulted in one in an actual combat, depending on wether F-22 was within engagement envelope of MICA IR, and wether the missile hit. 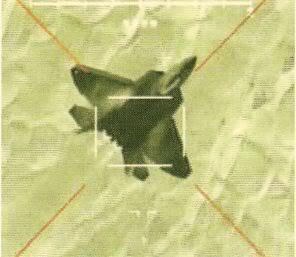 In fact, French have stated that, had they been able to simulate use of MICA IRs, it would have resulted in several F-22 kills. Actual video begins at 2:15. Rafale’s speed at beginning is 360 knots, and it is turning at cca 6 g. It continues turning, with a bit of rolling, at 4-6 g, entire time keeping the speed above 300 knots and even getting it up to 500 before executing a semi-vertical turn and achieving over 8 g at 2:46. At 2:49, F-22 flies into the view from right, and Rafale rolls, pulling up and gaining altitude afterwards, loosing F-22 at 2:54. Afterwards, Rafale turns around, pointing nose towards the F-22 flying below it at 3:04 and achieving a lock-on and a missile launch at 3:07. Rafale’s speed at time of missile launch was 157 kts. At 3:10, gun targeting outline appears. At 3:23, F-22 is again in view, though it does not result in either gun or missile kill, and Rafale pilot does not roll to follow the F-22. Rafale continues turning until nose is pointed upwards at 3:35, after which it turns towards the ground. At 3:59, it again has nose pointed mostly upwards, and turns sideways towards the ground. At 4:10, F-22 is again in sight, and Rafale turns inside the F-22. At 4:20 lock-on is achieved but Rafale pilot does not call a missile kill, with low speed warning appearing at 4:26 (speed cca 120 kts) and disappearing at 4:28, to reappear at 4:29; low fuel warning appears at 4:26. At 4:29, Rafale rolls, with speed at 4:31 being 91 knots, staying below 100 knots for next few seconds, causing low speed warning to blip. At 4:35, Rafale is turing towards the ground and speed has gone above 100 knots again. Rafale gets F-22, which has regained the energy, in its view at 4:40; F-22 is turning hard for next few seconds, and at 4:50, Rafale is directily behind the F-22 and has achieved the missile lock. At 4:50 and 4:52 gun piper comes across F-22 twice in a row but Rafale pilot does not call a kill. At 4:54, F-22 flies out of view and Rafale makes no attempt to follow; at 5:00, Rafale has returned to level flight, and at 5:23 Rafale pilot is heard requesting termination of engagement. As exercise was guns-only, missile kills were not counted. It is still clear that French statement about Rafale achieving several missile kills against the F-22 is correct. At around 4:40, Rafale pilot has missed an opportunity for another gun kill, but is otherwise mostly in control of the fight, with F-22 never gaining the initiative. Video does show that Rafale has good low-speed maneuvering performance and is capable of regaining lost energy at adequate rate. This entry was posted on December 21, 2013 at 7:31 am	and is filed under Uncategorized. Tagged: BFM, dogfight, F-22, Rafale, rafale vs f-22. You can follow any responses to this entry through the RSS 2.0 feed. You can leave a response, or trackback from your own site. Not really sure why this is such a big deal. I mean f-22s have also been beaten by t-38 talons for Christ sakes. Make no mistake the f-22, while designed to be a better close in dog-fighter than the f-15 is, it’s generally NOT meant to be a close in dog-fighter and will always struggle with smaller, lighter opponents in close range. I think in general f-22 pilots due to maintenance, cost, and small numbers don’t get to properly train for different combat scenarios other than the typical, head on radar shots against aircraft unable to respond. Given it’s kinematics (and all of it’s other issues aside) I think in the right hands and flying the right type of fight ( higher speed, higher altitude) f-22 is still extremely capable in a WVR dogfight specifically in the instantaneous turn, prolonged turning dogfights is a different story. That being said it’s lack of IRST, the delay for the gun doors to open, Helmet mounted sights to take full advantage of the AIM 9X probably means it’s a moot point. Also I think thrust vectoring, though originally designed to help the f-22 in close range combat, is actually hurting it. The f-22s thrust vectoring is different from the early Suhkois style vectored thrust. (I’m not sure on the current sukhoi style) Unlike the Sukhois Vectored thrust, which is a switch/button that the pilot can initiate at the absolute desperate situation where a large energy bleeding sudden change in angle could be useful, the F-22s Vectored Thrust is controlled entirely by the computer. It is also not triggered by air-speed and designed to kick in at the AOA limit. This lack of human control hurts the raptors agility in particularly stressful close in maneuvering as the pilot (perhaps due to the lack of adequate training hours) will often pull too far back on the stick, raising AOA to maximum, inadvertently triggering thrust vectoring and killing a good portion of the raptors speed and altitude as is slowly falls out the sky. Because some people believe that the F-22 is the most-everything and cannot be beaten, BVR or WVR. Of course, that very much ignores both logic and physics. More specifically, there was talk about the F-22 winning one or even two engagement out of the six with rest being draws. But as I have shown, the original quote mentions only one F-22 victory out of six, with four draws. Any aircraft can be beaten and you can’t really expect a 20-ton aircraft to perform as well in WVR as a 10-ton aircraft with superior aerodynamics and lower wing loading. But as I said, some people don’t understand that. Thrust vectoring is also used to avoid using certain control surfaces that otherwise would increase the radar observability of the F-22.